Founded on June 24th in 1932, the Pulkovo Airport is one of the busiest and fastest growing international air hubs in Russia after Moscow's Domodedovo, Sheremetyevo and Vnukovo airports. The New Pulkovo Terminal in St Petersburg, Russia. In 2012 it had a capacity of 11 million passengers and, according to the last traffic forecasts, it is likely to process more than 17.3 million passengers by 2025 and has the potential to reach 40 million passengers by 2039. In response to this estimated increase in visitors and to improve the image of Russian transport infrastructure, the government decided to build a new, modern terminal to offer a pleasant experience to everyone traveling to and from Russia. In fact, St Petersburg airport is no longer small, disorganized and out-dated as, unfortunately, it was in the past; now it has everything you need to kill time while waiting for your flight. Note: The new, centralized terminal of St Petersburg Airport began operations at the very end of 2013. 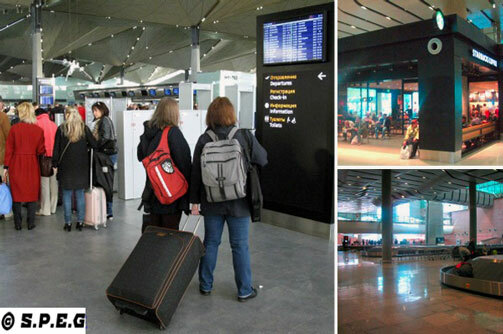 Located 23 km from the city center, and open for business in December 2013, the New Terminal of Pulkovo Airport (the third one) is the place where you will touch down or take off by plane. Forget about the old Pulkovo 1 and Pulkovo 2, they are both shut down. 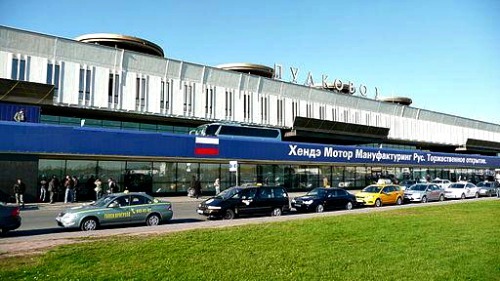 Now there is only one big terminal serving both international and domestic flights and that is Pulkovo's new terminal. So no more confusion! A look inside at the new Pulkovo Terminal in St Petersburg, Russia. The newly constructed building boasts 110 passport control desks to speed up immigration processing and has 88 check-in desks to avoid long queues. Inside you will find several shops and cafes, restaurants, ATM machines, a children's playground, a bank, an information desk, a car rental desk and much more to relax, stuff your belly, or refresh your mouth before your departure or after your arrival. Honestly, compared to the two old terminals, everyone landing at Pulkovo's new terminal will be impressed by the efficiency of the building, which consists of four levels connected by escalators, staircases and elevators. The first level, which is the ground floor, houses the arrivals and baggage claim area. The second floor houses the passport control area, a tourist center and several recreational areas. The third floor is home to the departures and customs area as well as additional recreational areas. The fourth floor has a playground for kids and a business lounge. We bet, nobody will be disappointed with this new terminal! Rather, everyone will be amazed not only by the comfort it offers, but also by its glass skylights and geometric panels and the unusual gold, domed ceiling that surely will remind you of the stunning domes on the city’s Church of the Savior on Spilled Blood. Designed by the architect A.V. Zhuk and built in 1973, the Pulkovo airport terminal I served domestic flights and flights to the former soviet republics until December 2013. Although it is now closed, there are rumours that once the current renovation has been completed all domestic flights may once again depart from here, or it may be used as passenger waiting area for the new terminal. We'll keep you posted on that! Built in the early 1950s and completely renovated and redesigned back in 2003, the Pulkovo Airport terminal II served international flights until December 2013. 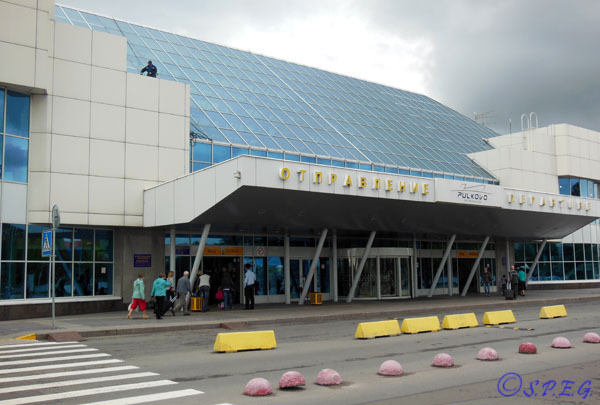 Today it has been shut down and replaced with the new, modern terminal Pulkovo. To get to town from the airport, you can take a taxi, the bus №39 or a minibus K39. They will all bring you to the nearest Moskovskaya Metro station in no more than 20-30 minutes, depending on traffic. The city bus stop is located at the exit of the arrival hall on the ground floor of the terminal, and runs daily every 15-20 minutes from 5.30 am until 01.30 am. Alternatively, the Minibus runs every 5 minutes from 7.00 am until 23.30 pm, every day of the week. As of year 2018 the ticket price is 40rubles (€0.60/$0.65) for the city bus, 45rubles (€0.70/$0.75) for the Minibus, and should be no more than 1200rubles (19€/23$) for a taxi ride, while the cost of the baggage is 35rubles per piece, if a suitcase is extremely large. If you want to avoid getting overcharged by hotels or illegal taxi drivers, and don't want to struggle with your luggage but travel stress free, then your best option is to book a private transfer before your arrival. If you want to take a taxi upon your arrival avoid taking a taxi offered by one of those helpful guys hanging out at the airport, but look only for the official Pulkovo Airport Taxi, or you will be cheated on the price. If you are on a tight budget, or you just want to save money, the cheapest option is to take a bus to the nearest Moskovskaya Metro station. From there you should be able to continue your journey easily to your final destination. Beware of the money exchange office, which offers poorer rates than downtown. A better deal would be to use the airport ATMs, or much better, go to a local bank, which give rubles at the official Central Bank Exchange rate. However, note that ATMs they may not always be working, so make sure you have in your pocket some Euros or US dollars to change before taking the taxi. For your information, Russian drivers only accept rubles as payment option. No credit cards! Tipping is your prerogative, like anywhere else, 5-10% for a cab fare is normal. As of March, 28 2014 the Pulkovo-2 international airport does not operate any flights and is closed. All flights - local and international - depart/arrive to the new terminal. From Pulkovo Airport return to St Petersburg Airport or go back to the Homepage.